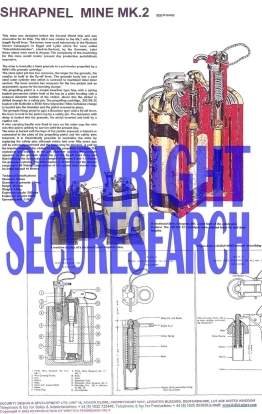 This security poster illustrates the Shrapnel Mine MK.2 United Kingdom Anti-Personnel Mine. This mine was designed during World War II and operated as a ‘giant’ grenade. Although redundant for many years, many of these mines were deployed in North Africa, and later in Angola, and are still encountered today. This security poster features the technical specifications of the Shrapnel Mine MK.2, a sectioned, Mine, MK.2 with both safety pins in place, pages from a British WW2 manual describing the parts of the mine, and a wartime display of a sectioned as well as a complete mine. A sectioned, Mine, MK.2 with both safety pins in place. A wartime display of a sectioned as well as a complete mine. Pages from a British WW2 manual describing the parts of the mine. The technical specifications of the Shrapnel Mine MK.2. This security poster features the technical specifications of the Shrapnel Mine MK.2, a sectioned, Mine, MK.2 with both safety pins in place, pages from a British WW2 manual describing the parts of the mine, and a wartime display of a sectioned as well as a complete mine.